We are a leading Manufacturer of 80% wdg sulphur from Nashik, India. Thiosulf contains 80 % elemental Sulphur in very tiny micro granule form.The elemental Sulphur present in Thiosulf is in highly pure form. Thiosulf is manufactured by adopting advanced technology.It is contact fungicide.Thiosulf is known for versatile control of fungi & red mite. Thiosulf has multisite action as fungicide & miticide. Mildew on Grapes, Cowpea, Gaur, Pea, Cumin, Mango and Scab Disease of Apple. Dose :-Foliar Spray :- 1.5 gm to 2 gm / liter of clean water. 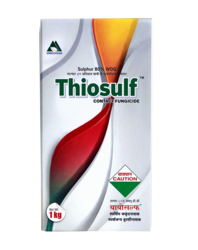 Compatibility :-Thiosulf is suitable for all types of crops for foliar spray except Cucumber species. Packing :- 500 gm, 1 Kg, 5 Kg. Looking for SULPHUR FUNGICIDE ?